Scholastic Press, New York, 2015. 32 pages. Okay, there’s something that simply pleases me about this book. Why green lizards and red rectangles? I have no idea, and we’re never told. 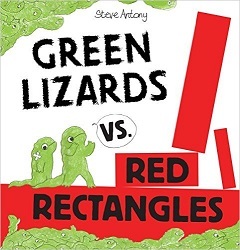 What we are told is that the green lizards and the red rectangles were at war. The story is simple, and the pictures are everything. This book is primarily about clever graphic design. Which is tremendously clever and fun. But it does also have a good message. Sometimes fighting is not a good idea, and if you work at it, you may find a solution. This is the sort of book that makes me laugh because of what’s taken for granted. Green lizards and red rectangles? At war? How on earth did the author come up with that? I don’t know, but the result is beautiful, clever, and has a good message. The next time you’re tempted to fight, ask yourself, Are we like green lizards and red rectangles? If we think hard enough, is there a way we could get along? This entry was posted on Monday, May 30th, 2016 at 8:26 pm and is filed under Delightfully Silly, Picture Book Review. You can follow any responses to this entry through the RSS 2.0 feed. You can leave a response, or trackback from your own site.